Last weekend in Boston it was hot and humid—a typical mid-July day in the Northeast. Despite the heat, roughly 300 attendees gathered together for WordCamp Boston at the Sherman Union Hall at Boston University to talk WordPress. The event featured talks by Scott Wyden Kivowitz, Amy CQ, John Eckman, Fred Meyer, Mel Choyce, and many more. 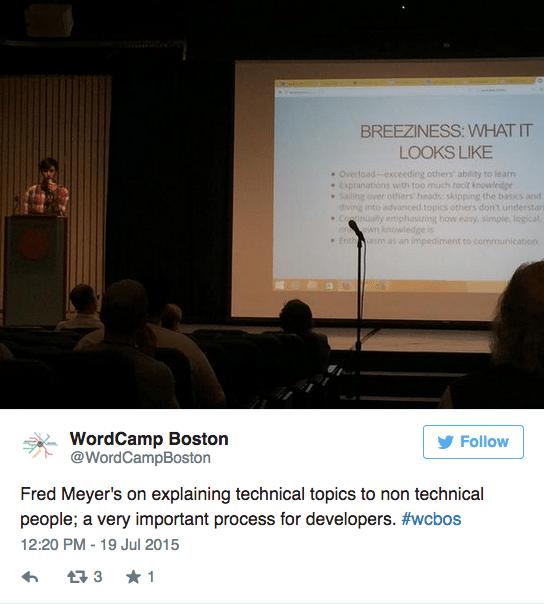 Let’s take a look at some of the highlights from WordCamp Boston. In Mel’s presentation she highlighted some design trends that we can expect to see in the near future, such as gradient design, resolution independence, and icon fonts, just to name a few. One of the more obvious trends Mel discussed was responsive web design. She pointed out that this is, in fact not a trend, it’s an expectation. “Go responsive or go home.” She sited some rather compelling information that showed “Responsive” as the most used feature filter in the theme directory. Mel also discussed how specialization in theme development is becoming more and more popular. This means that theme buyers are actually looking for more specific themes. She referenced that more than 70% of Themeforest searches are focused around niche themes. This suggests that site owners are looking for themes to cater to their individual needs rather than, the common expectation that buyers simply want themes with most features crammed into them. AmyCQ of Hughish.com talked about the importance of content, particular in relation to small business owners or solopreneurs. The talk was geared towards those without a team managing their content. Content adds incredible value to your company. It can be used as a vessel for both acquiring new customers and retaining current clients, Amy pointed out. It keeps them returning to your website. Before you start blogging, it’s important to identify your audience. “It’s not about you, it’s about them,” Amy said. Listen to your clients. What are their problems, concerns, worries? What are they saying on Twitter and Facebook? This can help you identify pain points, which can in turn help you create relevant, interesting content. Similarly, writing content that addresses frequently asked questions allows you to direct clients to posts that answers their questions, rather than writing out a long explanation each time. The presentation went on to address the importance of organization when it comes to content creation. “The worse plan is no plan,” Amy said. This is particularly true when it comes to getting started. Creating an editorial calendar, regardless of if you modify or make changes to it regularly or last minute, is an effective way to stay organized and keep yourself on a schedule. Amy pointed out that it doesn’t need to be an elaborate calendar, sometimes just a simple spreadsheet will do. WPShout’s Fred Meyer kicked off his talk entitled Explaining Hard Things to Humans with a powerful analogy. He explained that, as a WordPress expert, you’re on top of a hill. With all the great views, you have privileged knowledge. You can see what’s happening in all directions. There are also people in the valley. These people don’t have the same knowledge as those with the great views, and may sometimes need access to hilltop information. This is incredibly useful when working with WordPress where often times the level of assumed knowledge is high. All presentations from WordCamp Boston were recorded and will soon be live on wordpress.tv! 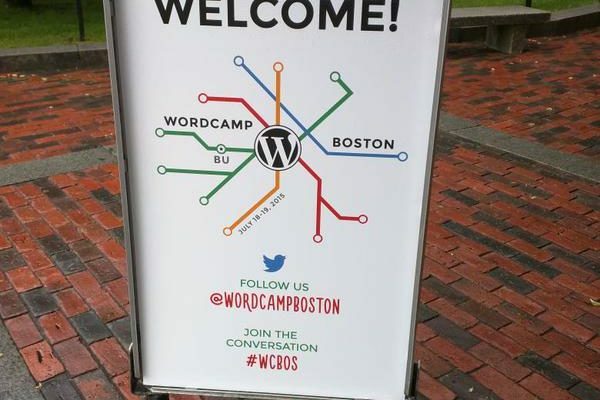 Did you go to WordCamp Boston? Share your favorite memory in the comments below.